I am a huge fan of choose your own path adventures and when I saw that Steve Jackson’s Sorcery! is getting the choose your own path treatment on iOS, I was extremely excited. Fortunately, it appears that I had all the reasons to be happy and I am sure you will agree with me after reading this Sorcery! review or, even better, after playing the game. The game puts you in the shoes of a nameless hero, a super warrior that embarks on an epic quest to retrieve the Crown of Kings. Along the way danger lurks around every corner, villages are to be visited and friends are to be made, but most important is the fact that the story is shaped based on your actions. And there are tons of choices to be made, with no obvious right choice and many times with surprising results. In my case, I finished this first episode (Because yes, the game is actually titled “Sorcery! 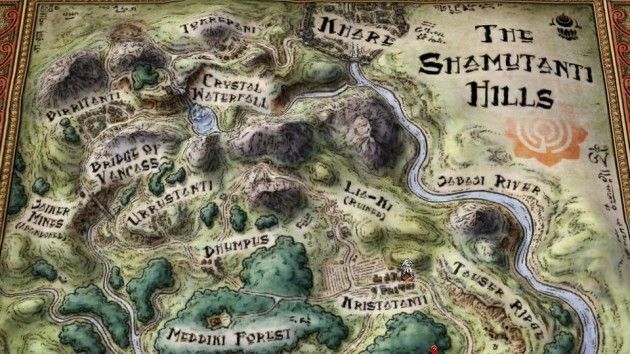 Episode 1: The Shamutanti Hills”) without managing to make any friends, but fortunately getting rid of a pixie-like creature that stopped me from casting magic, just a few gold pieces in my pocket, the teeth of giants and fortunately a key to Khare (the next stop in the next chapter) after rescuing a princess following an epic battle. I’m not that great of a hero, after all, but I am sure things will change. Enough about me, though – let’s talk about about Steve Jackson’s Sorcery! A thing that I really enjoyed is that the game isn’t just a “book” that you read and turn pages and select choices. No, you actually have a very nice element added to the game, with your hero represented on the world map as a tabletop figurine that you drag to your next location. 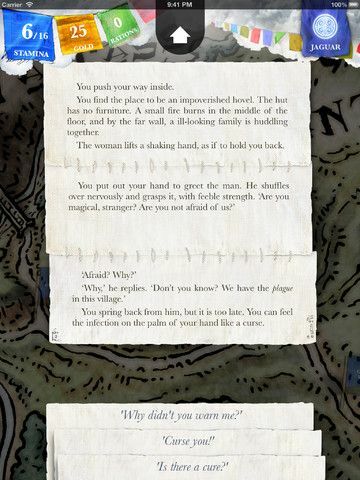 Other visual elements, including a Spellbook, an inventory that you can access anytime and representations of your money, stamina and rations are also some small details that make everything a bit more interactive and less boring than your usual “read only” choose your own path adventure. Of course, the writing still plays a major part here and, as you would probably expect, we’re talking about brilliant writing! 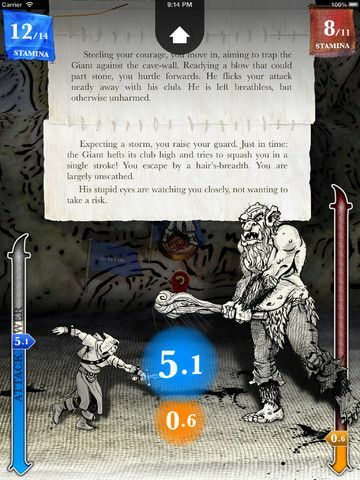 Steve Jackson’s Sorcery not only allows you to read and experience and amazing fantasy novel, but let’s you shape its story as well, which is absolutely amazing! And since I was talking about interactivity earlier, moving the hero on the map is not the only interactive thing that you can do: battles are also handled nicely, with the random factor being somewhat removed – we don’t have to roll dice to determine the fate of a fight, but instead we have to drag our hero sideways to decide the power of the attack. The idea in battles is to have a more powerful attack than your enemy, without wasting your energy though. It’s a guessing game still but I had no problem being successful in the battles I fought – including an epic Manticore fight – even without using magic. And the use of magic is something that I didn’t quite like because, well, in the first part I was quite lazy to learn and in the second part I couldn’t use it because of a poor choice along the way. Either way, casting spells is almost as difficult as it is in real life (you actually have to learn and spell the… spells) so I am glad I could do it without it. However, a more simplified magic system would’ve made this amazing game even greater. All in all, despite its relatively high price tag ($5.99 at the moment), Steve Jackson’s Sorcery! is a brilliant game, a true work of art that indie studio inkle should be really proud of. For the gamers – especially if you are a fan of choose your own path style of games – this first episode of Sorcery! is a must play game.